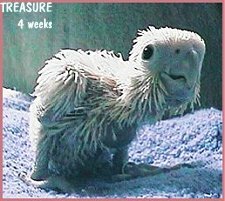 This is Treasure at six weeks old. He now weighs 256 grams and is being handfed four times a day. 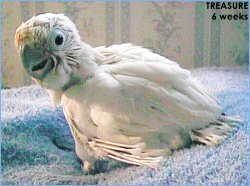 His feathers are coming out of their protective keratin sheaths, and in a few days he'll be ready to move from his warm brooder into a cage where he'll learn how to perch, climb, play and eventually learn to eat on his own. 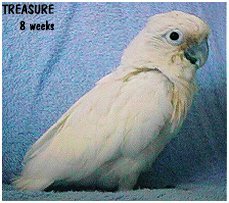 This is my Goffin's Cockatoo, "TREASURE." 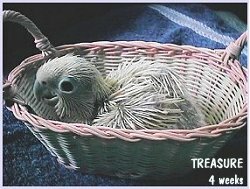 He was hatched on March 7, '99 and was given to me by my wonderful son and daughter-in-law as a gift on March 28th at the age of 3 weeks. These pictures were taken on Easter Sunday, his 4 week birthday. He weighs 194 grams and is being handfed formula every three hours. 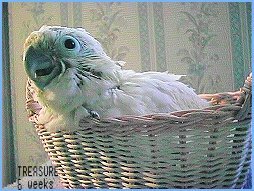 Since he has no feathers yet, he must always be kept very warm. A baby bird is a huge responsibilty! Here's my little angel at 8 weeks old. Looks all grown up, doesn't he? Well, he's still very much a baby, although he is starting to wean. He's eating a little on his own now so I only hand feed him 3 times a day. He should be fully weaned in another 4 weeks or so. He's able to step up onto his perch, which I placed down low in his cage, and has just about mastered perching. His tail feathers have a little more growing to do, but you can see he's otherwise fully feathered. I enjoy watching my babies grow up. I hope you enjoy it too! 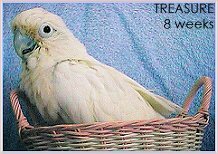 A PET BIRD IS A *LIFETIME* COMMITMENT!